Where should I retire? How do I maintain my quality of life during retirement? What’s the best place to retire for active living? If you’re asking these questions, you’re in the market for a property management agency that’s also a resource. At Southern Residential Leasing, helping you find the perfect long-term rental is what we do. We realize you’ve worked hard to retire, so we start by listening to exactly what you want. Then, we make sure a property suits your budget and your lifestyle. Whether you’ve lived here before or are new to the area, we know why you want to live on the Gulf Coast. The even better news is, retiring to Northwest Florida or Coastal Alabama is a wise financial choice. According to the experts at CNN money, for “people 65 and older, renting [makes] more financial sense…” This is true if you already have a home in another state, or don’t need to build equity in a retirement home. The advantages of renting with Southern Residential Leasing are about peace of mind. You can hand-pick amenities, outsource home maintenance, and rely on our experts to keep things running smoothly. Plus, our coastal communities are activity-oriented. Each area offers a range of free outings like library clubs, art walks, and movies in the park. With so much to do, and so many residents from all around the world, you’ll have no problem connecting with people who share similar interests. Nearby Southern hubs include Mobile, Biloxi, and New Orleans to the west. To the east are Atlanta, Tallahassee, and Jacksonville. Not to mention, Interstate-10 provides a straight-shot across the region. It’s the ideal place to live for road-trips and great rates on airline fares. If the beach wasn’t enough, travel ease is a great incentive for when the kids and grandkids visit. 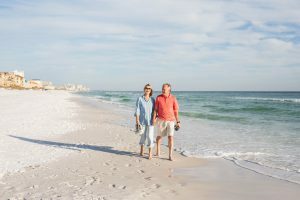 There’s just no better place to retire than Northwest Florida and Coastal Alabama.